Fig. 79 Gains from trade. (a) The physical output of commodity X and commodity Y from a given factor input. (b) Production and consumption possibilities with and without trade (internal exchange rates are 1X/1Y in A, 1X/3Y in B, and the international exchange rate 1X/2Y). the extra production and consumption benefits that countries can achieve through INTERNATIONAL TRADE. Countries trade with one another basically for the same reasons as individuals, firms and regions engaged in the exchange of goods and services - to obtain the benefits of SPECIALIZATION. By exchanging some of its own products for those of other nations, a country can enjoy a much wider range of commodities and obtain them more cheaply than would otherwise be the case. International division of labour, with each country specializing in the production of only some of the commodities that it is capable of producing, enables total world output to be increased and raises countries’ real standards of living. A country's choice of which commodities to specialize in will be determined in large measure by the advantages it possesses over others in the production of these things. Such advantages can arise because the country can produce particular commodities more efficiently, at lower cost, than can others. The static, or ‘pure’, theory of international trade emphasizes that opportunities for mutually beneficial trade occur as the result of differences in comparative costs or COMPARATIVE ADVANTAGE. Countries will gain from trade if each country EXPORTS those commodities in which its costs of production are comparatively lower and IMPORTS commodities in which its costs are comparatively higher. It can be seen that country B is absolutely more efficient than country A in the production ofY and just as efficient in the production of X. However, it is comparative advantage, not ABSOLUTE ADVANTAGE, that determines whether trade is advantageous or not. Country B's comparative advantage is greater in the production of commodity Y, of which it can produce three times as much as country A. Alternatively, we can say that country B's relative efficiency is greater in producing commodity Y because the resource or opportunity cost of producing an additional unit of Y is one-third of one unit of X in country B but IX in country A. Country A, by concentrating on the commodity it can produce with least relative inefficiency, has a comparative advantage in the production of X; i.e. the resource or opportunity cost of producing an additional unit of X in country A is only 1Y, while in country B it is 3Y. 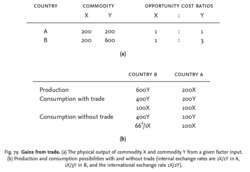 Thus, in terms of real factor costs, commodity X can be produced more cheaply in country A, and commodity Y can be produced more cheaply in country B. This combination of comparative advantages opens up the possibility of mutually beneficial trade. Domestically in country A, 1X can be exchanged for 1Y, but abroad it can be exchanged for anything up to 3 Y Trade will be advantageous to it if it can obtain more than 1Y for 1X. Domestically, in country B, 1Y can be exchanged for one-third of 1X, but abroad it can be exchanged for anything up to 1X. It will be to B's advantage if it can obtain, through trade, more than one-third of X for 1Y . The limits to mutually beneficial trade are set by the opportunity-cost ratios. Within these limits, specialization and trade on the basis of comparative advantage will enable both countries to attain higher consumption levels. This possibility is indicated in Fig. 79 (b), assuming the exchange ratio to be 1X = 2Y Using its entire resources, country B can produce 600Y, of which it consumes, say 400 and exports 200. Country A can produce 200X, of which it consumes 100 and exports 100. With trade, the 200Y can be exchanged for 100X, enabling country B to consume 400Y and 100X, and country A to consume 200Y and 100X. Without trade, country B can transform (at an internal exchange ratio of 1X/3Y) 200Y into only 662/3X, while country A can transform (at an internal exchange ratio of 1X/1Y) 100X into only 100Y. Thus both countries gain by specialization and trade. How the gain is shared between countries A and B depends essentially upon the strength of demand in the two countries for the goods they import. If country A's demand for commodity Y increases, the trading ratio of IX to 2Y would be likely to move against country A. Thus it might require 21/2Y exports to obtain IX imports, pushing country B nearer to the limit to mutually beneficial trade. Obviously, in a more complex multicountry, multiproduct ‘real’ world situation it is less easy to be categorical about who gains from international trade and by how much. Some countries may possess a comparative advantage in a large number of products; others may possess few such advantages - countries differ in the quantity and quality of their factor endowments and are at different stages of ECONOMIC DEVELOPMENT. DEVELOPING COUNTRIES, in particular, may find themselves at a disadvantage in international trade, especially those that are over-reliant on a narrow range of volatile commodity exports. Granted, some individuals capture more in the gains from trade than their trading partners do, but so long as both parties benefit, a win-win exchange occurs. Furthermore, disaggregation also greatly amplifies the estimated gains from trade liberalization. If "real cost" is measured in terms of labor, Ricardo's interpretation is consistent with what Jacob Viner called the "eighteenth-century rule" for the gains from trade, according to which "it pays to import commodities from abroad whenever they can be obtained in exchange for exports at a smaller real cost than their production at home would entail" (Viner 1937, p.
How would David Ricardo have taught the principle of comparative advantage? As Adam Smith noted, the gains from trade are limited by the extent of the market. Beyond Doha, gains from trade could also come from the recent rise in South-South trade. Others have attempted to vindicate Smith's theory of the gains from trade, arguing that the vent for surplus is meant to apply only to underdeveloped economies (Myint 1958, 1977; Staley 1973) or where goods are produced jointly (Kurz 1992). At the same time, they diverted attention away from economics and onto diplomacy by stressing the geopolitical gains from trade agreements - notably, cementing the Western alliance and keeping Third World countries from defecting to the Soviet camp. In the market setting, it is the potential for gains from trade that encourages cooperation," the authors point out. Their topics include Brazilian trade policy and the US, a history of trade relations between Canada and the US, a quantitative assessment of the inter-war Australian trade policies using a computable general equilibrium (CGE) approach, Austrian economic policy challenges of gains from trade, skill distribution and systems of cities in a north-south trade model, a progress report on the Middle East Free Trade Area, and regional trade blocks in a non-cooperative network. It was Smith who separated the politics of winning and losing from the problem of establishing the gains from trade. The theory says that even a nation that is less efficient in every industry will achieve gains from trade, and so will a nation that is more efficient at everything.